– I and my chef friends would like to serve Swedish produce at our restaurants. Björn’s restaurant Frantzén in the Old Town in Stockholm is classed as the 12th best restaurant in the world, and the 15 chefs he had gathered at the start of the project represented some of the best restaurants in Sweden. One could say that these restaurants is Sweden’s image to the rest of the world as a Food Country. – When I asked what the problem was Björn told me that almost none of the top restaurants had served Swedish chicken or pork for a long time, instead importing expensively from France or Spain. Sweden has a good level of standard products but the chefs want a meat which really tastes of pork and bird and they couldn’t source that in Sweden. This brought LRF to start the Exceptionell Råvara project with the purpose of increasing the range of products in pork and poultry. Today this is run together with Martin & Servera, Svenskt Kött and Visit Sweden, with the support of the Swedish Board of Agriculture. Sören Persson thinks that Swedish produce must be able to compete with the best produce on the international scene. 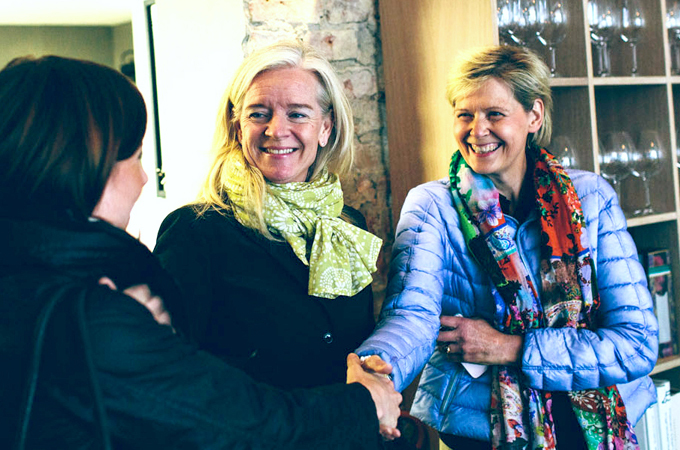 – It is crucial to create an attraction and market for Swedish produce. Without stimulating the best there can be no breadth of range further down in the chain – the food market is under the same rules as the sports market. Sören Persson at LRF leads a tasting at Ulriksdal in October, 2013. Photo: Erik Olsson. Mattias Dernelid at Smakriket is the person responsible for logistics and ensures the produce is delivered at the correct time. Smakriket is a part of Martin & Servera and they see many advantages of being involved in Exceptionell Råvara. – Even the goods which are not exceptional will find their customers in the market and farmers will become more and more secure in finding a market to be able to sell their quality goods. So luxury products and the top chefs will drive the market for all. 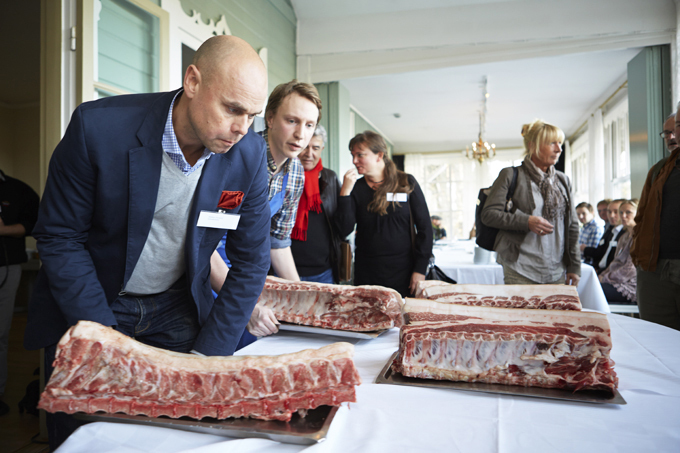 Mattias Dernelid and Viktor Westerlind present Swedish pork. Photo Erik Olsson. Maria Forshufvud at Svenskt Kött thinks it is a positive sign that the initiative for Exceptionell Råvara has come from the chefs. – We need both a breadth of offerings and absolute excellence, and here it is excellence we are talking about. We welcome all product development of Swedish meat products, increased differentiation also increases interest amongst the top chefs and general public. For instance, that we got Swedish piglet into the Bocuse d’Or was a result of the collaboration amongst Sweden’s elite chefs. Maria says the Swedish meat industry has the task of providing information on the strict regulations in force and what it means. – Through this we can contribute to the knowledge of the chefs on how animals for the meat industry are raised in Sweden. I also look forward to experiencing Swedish meats at the best Swedish restaurants and see what the chefs do to prepare it. It is inspiring, we learn all the time from the preferences we have. The chefs in the project have for example a greater interest in buying the entire animal and use all of it, something we are not used to today. Seeing the chefs at the Tasting meetings testing meat has also contributed to our understandings of their needs and wishes. – I have never seen such huge cutlets, and it was interesting to see how interested chefs are by the fat on the meat. They just taste it raw. Ami Hovstadius at VisitSweden with Maria Forshufvud at Svenskt Kött. Photo: Love Strandell. Ami Hovstadius at VisitSweden believes the project has increased interest in other countries for Sweden as a culinary destination. – A world-class food country needs local produce that is also world-class. Foreign visitors want to experience the local food culture, Swedish produce and tastes. For that reason it’s good to run projects which drive the development of produce of the highest quality for restaurants and which simultaneously contribute to diversity. Collaboration between chefs and farmers increases the opportunities to offer tourists holistic experiences. Today it is not only about offering guests an exceptional dinner in a restaurant – patrons want to hear the story “behind the plate” which enhances the experience and provides the visitor with food memories to carry back home. Ami explains how foreign visitors are a source of increased revenues for Sweden’s restaurants, cafes and farm shops. – Today they spend 38 billion crowns annually on food and drink, an increase of over 30 percent over recent years, and we can see demand increasing. When Sweden develops new products with a local flavour interest increases amongst curious tourists. They see Sweden as a dynamic food destination to where they can travel to discover new tastes and experiences. The more we do product development, the more we have to sell and offer the tourist interested in food.